Individuals and companies using ‘cracked’ copies of graphics software are receiving worrying emails demanding large cash settlements. 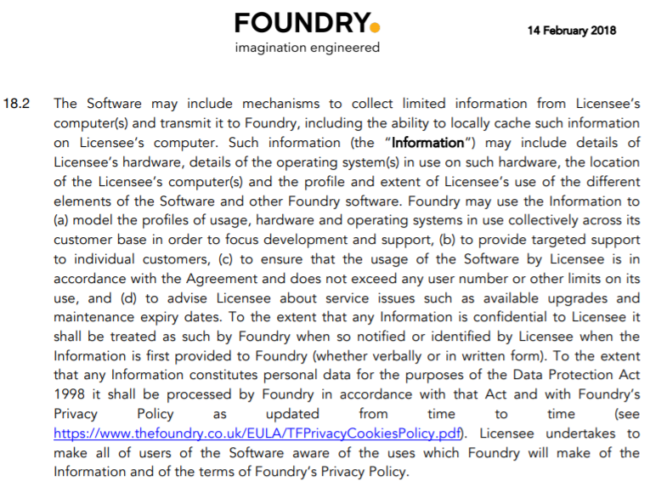 Information reviewed by TorrentFreak reveals that UK-based company Foundry is demanding thousands of dollars in compensation after unlicensed software ‘phoned home’ with details of users’ alleged offending. If ever there were a case for rejecting requested device permissions, it’s made by an Android app with more than 10 million downloads from Google Play. The official app for the Spanish soccer league La Liga was recently updated to seek access to users’ microphone and GPS settings. When granted, the app processes audio snippets in an attempt to identify public venues that broadcast soccer games without a license.According to a statement issued by La Liga officials, the functionality was added last Friday and is enabled only after users click “yes” to an Android dialog asking if the app can access the mic and geolocation of the device. The statement says the audio is used solely to identify establishments that broadcast games without a license and that the app takes special precautions to prevent it from spying on end users. The whole New Zealand-based spying operation against Kim Dotcom and his Megaupload co-defendants was illegal, the High Court has ruled. The revelation appears in a newly released decision, which shows the GCSB spy agency refusing to respond to questions about its activities on the basis that could jeopardize national security. The NSA has operated a top-secret surveillance program out of an iconic AT&T building in Manhattan, documents indicate. Critics are right to be concerned about the FBI’s expanded power, especially when it comes to recruiting and deploying informants. That’s true regardless of why FBI Director James Comey acted as he did toward Hillary Clinton. Each new investigation and judicial inquiry proves Snowden’s core warnings were correct. In one month, an obscure procedural rule tweak will come into effect allowing US cops and federal agents to hack any computer in the world using a single warrant issued anywhere in America. No one in Congress has voted on this legal update. It means a warrant granted somewhere within the US can be executed on the other side of the country – or the other side of the planet. The change, approved by the Supreme Court, is in Rule 41 of the Federal Rules of Criminal Procedure. Right now, if law enforcement wants to hack a PC, they have to ask a judge for a warrant in the jurisdiction where it is located. With the rule change, they could do this to any computer anywhere in the US or the world. As a bonus, the change would also allow law enforcement – without a warrant – free rein to hack into computers that have already been hacked. So, for example, if you have a virus infection then law enforcement can go through your files at will.